Last weekend RJ finally broke his fourth-place streak, but not the way he wanted. On a night when he finally got the good starts he had been searching for, he crashed several times and finished 13th. 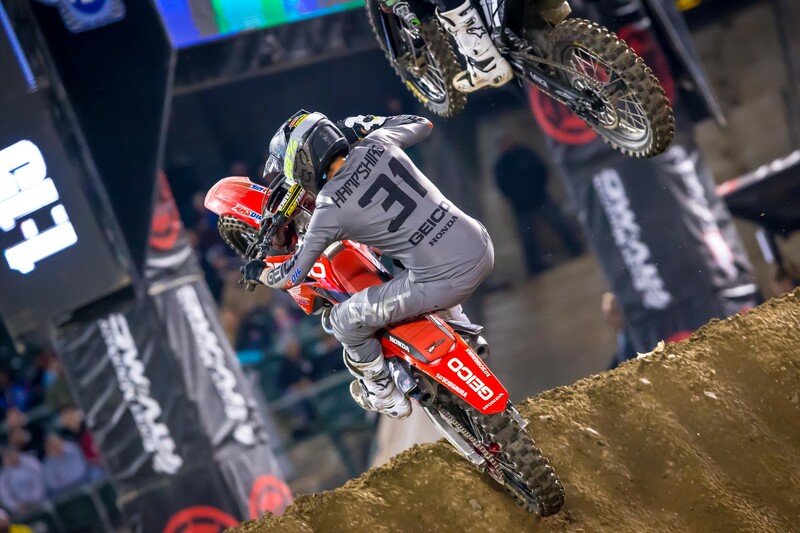 That was a big blow to any 250SX Championship hopes, because he’s now down 24 to series’ leader Colt Nichols. RJ and the rest of the 250SX West brigade have one more race tonight in San Diego before a long break, with 250SX East kicking off next weekend. What’s RJ’s plan from here? We asked. Racer X: How’s the season going so far? RJ Hampshire: I had a really good off-season. I was healthy and everything, and those first two rounds I felt awesome but my starts were just terrible. In Arizona I felt like I should have been up front but I think I was dead last in the first turn. But I was right on Shane [McElrath] at the end. Anaheim 2, bad starts. Then in Oakland I turned it around and got good starts, then just had stupid mistakes. I had a mishap in the heat while leading, went down, and in the main event I got a good start but over-jumped the triple by maybe a foot and lost my front right there. It was downhill after that—I had three more crashes. Four crashes total. It’s brutal because I do feel really good on the bike right now. Last week in Oakland I was fast on the bike all day but I couldn’t put it together. We’ve had really good days during the week, and the team and I have been testing quite a bit. Just have to bring it to the main event, really. Do you think last week, those crashes, is that just how it goes sometimes or were you just excited to have a good start and maybe overdid it? That’s the thing. Even in the heat race I was like, ‘Let’s be calm, I’m good.’ Same thing in the main event. I got a good start and it was like, we can do something with this. I was in third or fourth and it was like, ‘Let’s be calm and see what happens in this opening lap.’ Sure enough, I crashed. I wasn’t expecting what happened to happen when I over-jumped the jump. There was just no forgiveness. I just lost my front. Then I went down again, again, again. Just spiraled. Sometimes that’s how it works. Right now I just need to put all the pieces together and get that result in the main event. My main goal is to get ready for the outdoors. I kind of blew the whole championship last weekend, I’m quite a ways out. I do want to click off some good results in supercross. I told myself I really need to get a win this year, and I’d really like to click off some podiums. I want to do that, but I want to come into the outdoors and be really good. I want to be up front, and I haven’t been on the West Coast. I usually don’t come on until the East. I want to come on strong and be confident this year and put it on the box. So I’ll focus on getting ready for the outdoors and shift back to supercross after this break.